Hallo. I went to a Dutch Orange Day Animation screening at ACMI afew Saturdays ago. Wow. One in particular absolutley thrilled me to the core.. The Characters (1986) Script, design and direction: Evert de Beijer. "George and Belle are confronted with graphic symbols and letterforms which have come to life. These apparitions infiltrate their world, disrupt their relationship and become a strange and threatening obsession for them." This animation was fantastic! I have since discovered that Evert de Beijer also created the animation Car Craze which I saw at last years MIAF. Such lovely sophisticated work. Twas also very nice to see more Paul Dreissen on the big screen. Still nothing beats 2D or not 2D which I saw last year at MIAF. Well finally ..after months of trying to lift an idea from my mind and pen it into a comic for the next issue of TANGO..I have an idea that I want to draw, and one that grasps me as I think about it. Its funny because I have a certain kind of clarity with the idea, yet I do not yet have a script or narrative. I think this is my favourite way to work..on a comic that is. It means that I know I will be fully engaged with the idea as I create the narrative - because the source is defined - the essence. Now to put my money where my mouth is..and forget about this blogging stuff. Unless you've got a dodgey connection ofcourse. I wrote a blog entry at lunch time today..and it completely dissappeared. Ahh mystery.. Well it was quite annoying as I've not been so in tune with the ol' blog of late, and I had a bit of a speel about BASIL - the herb. I had a grafitti jam with Stew, Hee and Raj the other night. It was a bit fun I must say. Here is the image. HappyHee is in Seoul, Raj is in Dubai, and Stew is relatively close - same city as me infact. AN excerpt from a story I made for a belated birthday gift. I'm not sure how the Fizzog would feel about a bit of his birthday gift being online. But here it is.. I've been ensconced in my snippets of late. That is trying to cobble together more inkwinks fodder. I have afew sound bits that are short and loopable. There is one that I almost want to leave as is without visuals. Mmm we'll see. Projex afoot. Sneakily I slipped into a lunchtime ACMI screening of the Iron Giant. I say "sneakily" because I never feel quite comfortable going in to a cinema in the middle of the day ...I don't know why but it urks me. I was completely awe struck. It was magnificent to see on the big screen. The opening shot was very powerful.......this didn't strike me as much whenst I watched it on DVD a few years ago. I must say I was very glad to have extracted myself from my day and to have planted myself in front of this film. Such a well written story - I shed some little tears and I giggled out loud. Twas splendid indeed. I've been to see the Grotesque exhibition at the NGV three times now. The combination of closely working on an etching with a magnifying glass (see previous silverfish blog entry) and then having a long gaze at some very beautiful and evocative etchings is really quite a grounding experience. Also inspiring ofcourse, but strangely grounding. It is the mark of the artist's hand that describes the image, it is the residue of this process that delivers the idea, the content, the image, ..the thoughts if you like. Its not just the idea, its the careful consideration of the delivery, and the 'peace' of time that was given/used by the artist to create the piece. I also visited G editioning one of his mezzotints yesterday. Lots of talk about silverfish. Re the etching I had to touch up last week. It didn't work. Well it did initially, then I was asked to touch it up a little more. I sat down again with my little magnifying mechanism and fixed it...a little too much..and the patch where the blighter of a silverfish had chewed it ended up looking like a bit of pooh. Serious action was required. I spent another evening focussing on the original set of images that this particular image is a part of, and indeed the poem with which it is 'bound' to in its final state. So then I created additional marks to the composition - which was tricky..as I had to emulate some light plate scratches. To get to the point: It was a success I managed to clear up any confusion between the etched image and ..pooh. The print has now trancended into a world apart from me. Its a "letting go" that I have mentioned before..and shan't harp on about it now. I've decided to eat the rest of Mel's wasabi peas Despite the fact that they make my tongue sting, my eyes water, and will probably give me a rash, I find them very hard to stop eating! Animation news: Well I was to venture out to see The Cat Returns, a studio Ghibli animation, but I've not yet fixed up an etching that is being picked up in a number of hours. The said etching has a spot on it that has been chewed by a silverfish..so I have to touch it up a bit with some watercolour. 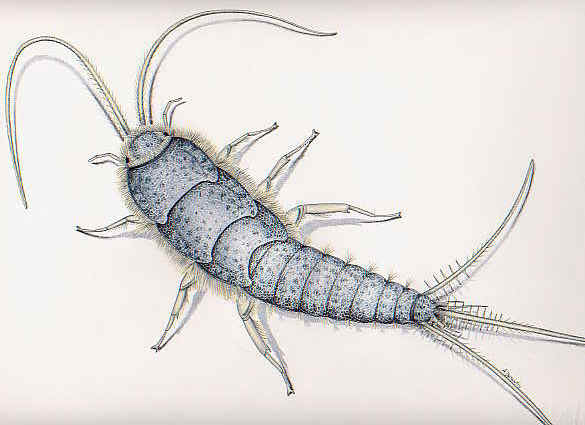 Silverfish, Lespisma sacchrina (Linnaeus) (Thysanura: Lepismatidae). I actually quite like silverfish, they have a lovely slippery way of moving. An anti-schmick picture for our entertainment, albeit brief. I animated some bats on Friday...it was quite a splendid experience I must say. When I am animating I am held by a sensation that can only be described as being in tune. It is really quite nice. I am still thinking about the ol' "Improvisation and Animation" research paper I wrote last year. I wonder if that feeling that I am getting during the creation of an animation can be expressed to the viewer. This reminds me of when I used to play music with Cam, Ted and Cloocas. There were occasional gigs that would have a moment in a song where it would feel as though everyone in the room listening had felt the same sensation of ...how can I describe it...perhaps I can't. Perhaps it is just a connection. Perhaps I just don't have words for it right now. It is music that does it though, and really we must all know that sensation that music is capable of imbuing in us. Like a transendence of some sort. I do go on in my sleepy and somewhat delerious current mindframe, perhaps I am just inspired by a song that I rediscovered recently. It is the most beautiful arrangement and refreshingly textured song. The first time I heard it I felt it had cast a spell on me. In that case I'll just pop up another picture. This is a drawing I did in England. It is titled "Things that smell"
Of course I have twiddled with it in Phiddlioshop, .........added the spearmint flavour and ruddied up the critters a little.